You might be aware that certain bottles of Scotch whisky, generally expensive single malts, are meticulously made and aged in Scottish distilleries with the intention that they're drunk neat or at the most with a drop or two of water to open up their flavors and aromas. Drink this esteemed type of whisky over ice or – gasp – with a mixer and you risk a scolding by any Scot who happens to be at the bar. OK, that's unlikely in reality, but you would still risk wasting an expensive spirit by diluting it or masking its nuanced flavors. With Johnnie Walker Red, itself a quality whisky, there are no such rules against ice or mixers. It's a blended scotch, designed by Johnnie Walker himself (or the company named after him anyway) to be drunk with mixers. With Johnnie Walker's permission, enjoy this particular bottle of scotch with a splash or a tall glass of soda water, soda, juice or multiple mixers, or incorporate it into a classic scotch-based cocktail. Johnnie Walker Red may have been developed for mixing, but that doesn't mean it's not also meant for drinking neat. 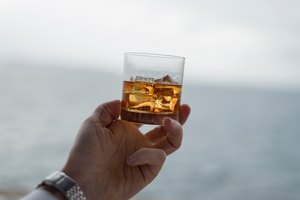 Scotch aficionados say the best way to taste the complex flavors of any Scotch whisky is to drink it neat, ideally in a snifter, a glass shaped like a tulip. A highball glass, tumbler or any short glass is fine as well. A standard serving is 1.5 ounces or a single shot. 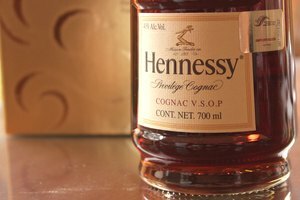 Adding a few drops of water is said to improve the tasting experience as it tamps down the strong alcoholic punch. Some eschew ice in scotch, but it's certainly not a rule. If you want to add ice, go ahead. 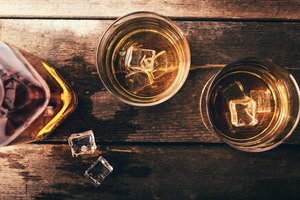 A single, big bar-style ice cube is best because it melts slowly and delays watering down your whisky. Soda water and tonic water, whether a small splash or a liberal pour, are great mixers for Johnnie Walker Red when you want to cut the alcoholic hit without altering the flavors of the whisky. 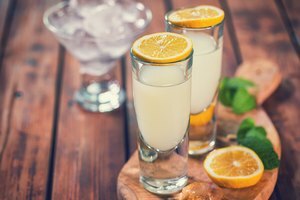 Flavored soda waters, perhaps lemon, lime or grapefruit, also work nicely with blended scotch, as do iced green tea, ginger tea and coconut water if you want a drink that's light and refreshing with no risk of drowning out the flavors of the scotch. Or consider bringing in the more definitive flavors of cola, lemon-lime soda, ginger ale or even lemonade. Many freshly squeezed or bottled fruit juices are lovely mixers for Johnnie Walker Red. Make a whisky sour with fresh lemon, lime or grapefruit juice, sweetened with a little simple syrup or honey syrup. Top this up with plain soda water for a boozy spritzer. Cranberry juice is nice with scotch if you like tart flavors, and a squeeze of lime adds a sour dimension. 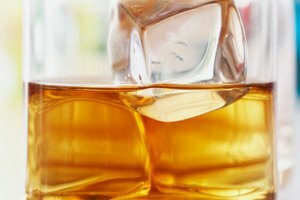 On the sweet side, there's orange, apple or pineapple juice, but keep the proportions in check to avoid disguising the whisky flavors. A dash of angostura bitters helps to balance the sweetness of scotch served with fruit juices. Classic cocktails featuring scotch are ideal vehicles for Johnnie Walker Red. 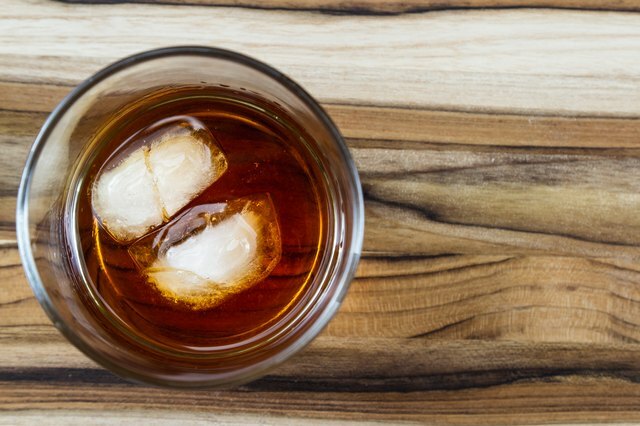 Try a godfather, equal parts scotch and almond-flavored amaretto. There's the rusty nail, a potent blend of equal parts whisky and Drambuie, a whisky-based liqueur flavored with honey, herbs and spices. A penicillin has a similar flavor profile, mixing scotch with lemon juice and honey-ginger syrup. Johnnie Walker recommends a riff on the mojito, made by muddling fresh mint leaves and adding simple syrup, scotch, club soda and plenty of ice. The Rob Roy is a variation on the Manhattan that replaces the original rye whisky with scotch, along with the two other ingredients – sweet vermouth and a few dashes of Angostura bitters. On a cold, blustery day, sip a comforting hot toddy, made with hot tea, lemon juice and honey, and doctored up with a dose of scotch.